On Wednesday evening, “Porkchop” Whitehead was the subject of a trivial scoreboard graphic at U.S. Cellular Field, serving to distract White Sox fans from a brutal display of baseball. The player’s ridiculous nickname prompted the commissioning of a post on the hurler by WSO brass, ASAP and at double the usual rate for the writer. John Whitehead began his career with a Van Alstyne, Texas semi-pro team before playing minor league ball in Sherman and Dallas. An unheralded prospect when he arrived in Chicago to pitch for the White Sox, Whitehead reeled off eight straight wins in his first eight starts for the Pale Hose in 1935, raising expectations for the rookie. The excitement was short lived, however. Whitehead lost his next six starts and fourteen of his next twenty. His ERA rose from 2.99 to 3.72 during that span. John Henderson Whitehead was born on April 27, 1909 in Coleman, Texas, seat of Coleman County. In the mid-1920s, if living in Coleman you were very likely to be a poor tenant farmer and a lot less likely to be an oil tycoon, reaping the rewards of 400,000 barrels of oil yielded annually by the county. Whitehead’s weight was a point of contention between the pitcher and manager Jimmy Dykes. In May of 1937, Whitehead was reportedly suspended “indefinitely” for “lack of physical condition” (he missed a month). A short time later, the Tribune labeled Whitehead “the problem right-hander of the pitching staf [sic],” for his blasé attitude and voluminous appetite. At the opening of spring training in 1938, the Tribune jokingly celebrated “Pork Chop Johnny” weighing in at 207 pounds, after finishing the previous season at a reported 230. 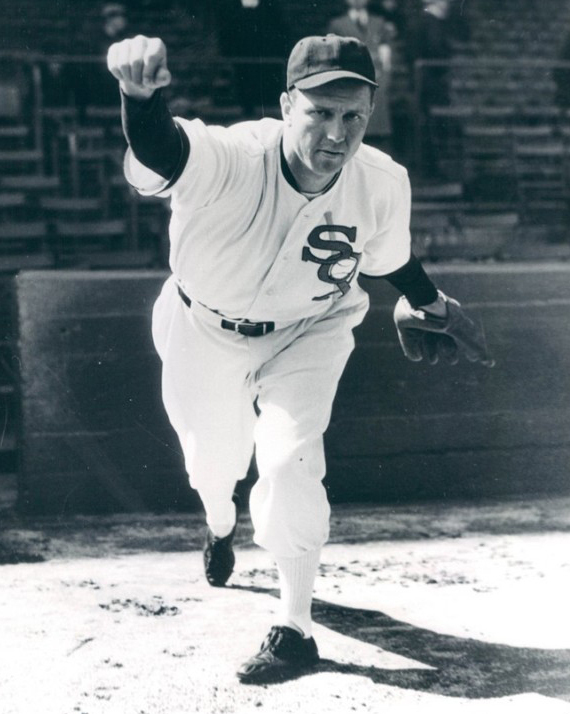 Before the start of the 1939 season, Marty Stratton, another White Sox right-hander from Texas, lost his leg in a hunting accident (Jimmy Stewart later played Stratton in the schmaltzy Hollywood biopic). Stratton was a poor shot but a good pitcher, probably the best on the Sox staff in ’38. 1939 didn’t go so hot. After sustaining a knee injury early in the season, no wins in four starts and an 8.13 ERA over 32 innings prompted a trade to the St. Louis Browns for Johnny Marcum on June 2. In St. Louis, the embattled Whitehead never could find his rookie form. Although he did throw a shortened no-hitter in 1940. Whitehead’s major league career ended in 1942. He returned to Texas, where he died after a brief illness on October 20, 1964 at the age of 55. He is buried next to his wife Winnie in Fannin County, TX; a ball and baseball glove adorn his headstone. Death certificate information suggests that Whitehead worked in road construction after baseball. Later in his life, John Whitehead lived and passed away rather innocuously. While in his youth the White Sox pitcher was a controversial figure who many believed never reached his full potential as a ballplayer. But now, for me, Whitehead has attained superstar status almost fifty years after his death. Only a story like Pork Chop Johnny's could divert my mind from the 2012 White Sox--whose demise now feels inevitable--for an entire afternoon. So here's to you John, relishing in victuals at the great clubhouse buffet in the sky. DYKES SUSPENDS WHITEHEAD FOR INDEFINITE TERM: Sox Pitcher Fails to Get Into Condition.